SS Normandie II liner launched in 1932, history and images. 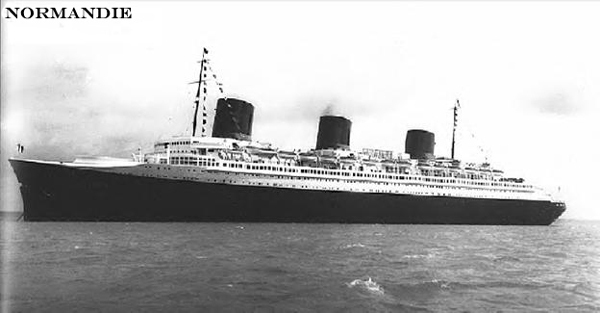 Normandie was built for the French Line with the help of a government subsidy at a time when Cunard were building a similar sized liner in Britain. This became a worrying time for the French Government as they had invested heavily in shipbuilding. They hoped to lift the moral of the country by giving the French people something to be proud of; the largest and fastest ship in the world. Normandie was the first ship to exceed 1,000 feet in length, the first over 60,000 tons, and the first large liner to be powered by turbo electric machinery. This system works by the steam turbines turning electric generators; the generators power electric motors that in turn drive the propellers. The advantage of turbo electric machinery is the propellers can be changed to reverse with full power. Capable of carrying 848 1st, 670 2nd and 454 3rd class passengers, Normandie set out on her maiden voyage from Le Havre - New York May 29th 1935. With a crossing of 4 days, 3 hours and 2 minutes, she became the first French ship to take the Blue Riband. Her average speed of 29.98 knots had easily beaten the westbound record of 28.92 knots set by the Italian liner Rex in 1933. Normandie took the eastbound record from the North German Lloyd Line’s Bremen on her return crossing by increasing that average from 28.51 to 30.31 knots. She was undergoing repairs to cure vibration problems in 1936 when the French Line received the news they had been dreading, the new British liner Queen Mary had a greater tonnage. At that time, Normandie’s upper decks were extended so she could once again hold the title of the world’s largest ship. The outbreak of World War Two in August 1939 forced the French Line to lay Normandie up at New York’s pier 88. She lay idle in New York until the Japanese attacks on Pearl Harbor December 7th 1941. With America then at war with Japan and their Allies Germany, Normandie was seized by US Authorities to serve as a troopship under the name Lafayette. During her conversion to a troopship, sparks from an acetylene torch set off a fire. The fire spread throughout the ship so quick the workforce had to be evacuated. Within a short time, fire fighters began pouring tons of water onto the flames. As Normandie’s watertight doors were closed, she became top heavy, snapped her moorings and capsized. Her burned out hulk lay at pier 88 for 18 months before a salvage operation began. The only way to get the huge ship upright was by dismantling her superstructure first. 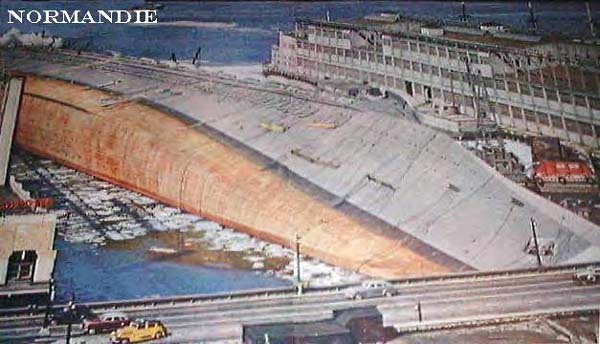 After the removal of Normandie’s upper decks, her hull was finally re-floated in October 1943. Rumors began spreading at that time she would be converted to an aircraft carrier. However, by the end of the war, Lafayette had been untouched since her salvage. The French Line’s inspection of their flagship in 1945 assessed her as being beyond repair. Arguably the finest Trans Atlantic liner ever built, and after only four years in service, she was scrapped at Port Newark/New Jersey in 1946.